Save money. Tell your plumber today. RootX is the effective foaming root control solution for your plumbing professional. 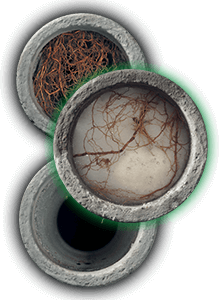 RootX kills roots in residential sewer lines, storm pipes and septic systems. Root intrusion left untreated can restrict flow, cause complete blockage and can eventually destroy a sewer or septic system, costing you thousands of dollars to repair or replace. RootX uses the aquatic herbicide Dichlobenil. It is non-caustic, non-fumigating and non-systemic, and, unlike other products, does not contain diquat dibromide, copper sulfate or metam sodium. RootX will not harm pipes, septic systems or above-ground vegetation (not for use in septic systems in the state of Florida). RootX has minimal environmental impact and is registered with the EPA (#68464-1) in all 50 states as well as Canada, and is classified as a General Use Product. In addition, RootX carries the signal word CAUTION, the lowest chemical hazard rating. RootX is now available through the online store or through your local plumbing professional. Yearly application of RootX can help you avoid costly repairs. Ask your plumbing professional about RootX and our annual reminder program. Get answers to key questions like "how do roots grow in sewer pipes?" and how RootX helps in our Frequently Asked Questions. Plus, read RootX reviews from real customers.